"Cordate" redirects here. It is not to be confused with Chordate, an animal phylum. The following is a defined list of terms which are used to describe leaf morphology in the description and taxonomy of plants. Leaves may be simple (a single leaf blade or lamina) or compound (with several leaflets). The edge of the leaf may be regular or irregular, may be smooth or bearing hair, bristles or spines. For more terms describing other aspects of leaves besides their overall morphology see the leaf article. Being one of the more visible features, leaf shape is commonly used for plant identification. Similar terms are used for other plant parts, such as petals, tepals, and bracts. acicular acicularis entire leaf Slender and pointed, needle-like. acuminate acuminatus leaf tip Tapering to a long point in a concave manner. acute leaf tip or base Pointed, having a short sharp apex angled less than 90°. apiculate apiculatus leaf tip Tapering and ending in a short, slender point. aristate aristatus leaf tip Ending in a stiff, bristle-like point. attenuate attenuatus leaf base Having leaf tissue taper down the petiole to a narrow base, always having some leaf material on each side of the petiole. auriculate auriculatus leaf base Having ear-shaped appendages reaching beyond the attachment to the petiole or to the stem (in case of a seated leaf). 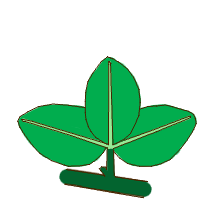 asymmetrical entire leaf With the blade shape different on each side of the midrib. caudate caudatus leaf tip Tailed at the apex. cordate cordatus entire leaf Heart-shaped, with the petiole or stem attached to the notch. cuneate cuneatus leaf base Triangular, wedge-shaped, stem attaches to point. cuspidate cuspidatus leaf tip With a sharp, elongated, rigid tip; tipped with a cusp. deltoid or deltate deltoideus entire leaf Shaped like Greek letter Delta, triangular, stem attaches to side. digitate digitatus entire leaf With finger-like lobes, similar to palmate. elliptic ellipticus entire leaf Oval, with a short or no point. ensiform ensiformis entire leaf Shaped like a sword, long and narrow with a sharp pointed tip. emarginate emarginatus leaf tip Slightly indented at the tip. falcate falcatus entire leaf Sickle-shaped. fenestrate fenestratus surface features Large openings through the leaf, see perforate. Sometimes use to describes leaf epidermal windows. filiform filiformis entire leaf Thread- or filament-shaped. flabellate flabellatus entire leaf Semi-circular, or fan-like. hastate hastatus entire leaf Spear-shaped: Pointed, with barbs, shaped like a spear point, with flaring pointed lobes at the base. laciniate lacinatus entire leaf Very deeply lobed, the lobes being very drawn out, often making the leaf look somewhat like a branch or a pitchfork. lanceolate lanceolatus entire leaf Long, wider in the middle, shaped like a lance tip. linear linearis entire leaf Long and very narrow like a blade of grass. lobed lobatus entire leaf Being divided by clefts, may be pinnately lobed or palmately lobed. lorate loratus entire leaf Having the form of a thong or strap. lyrate lyratus entire leaf Shaped like a lyre, pinnately lobed leaf with an enlarged terminal lobe and smaller lateral lobes. mucronate mucronatus leaf tip Ending abruptly in a small sharp point as a continuation of the midrib. multifid multi + findere entire leaf Cleft into many parts or lobes. obcordate obcordatus entire leaf Heart-shaped, stem attaches at the tapering end. oblanceolate oblanceolatus entire leaf Much longer than wide and with the widest portion near the tip, reversed lanceolate. oblong oblongus entire leaf Having an elongated form with slightly parallel sides, roughly rectangular. obovate obovatus entire leaf Teardrop-shaped, stem attaches to the tapering end; reversed ovate. obtrullate entire leaf Reversed trullate, the longer sides meet at the base rather than the apex. obtuse obtusus tip Blunt, forming an angle > 90°. orbicular orbicularis entire leaf Circular. ovate ovatus entire leaf Oval, egg-shaped, with a tapering point and the widest portion near the petiole. palmate palmatus entire leaf Palm-shaped, i.e., with lobes or leaflets stemming from the leaf base. palmatifid palma + findere entire leaf Palm-shaped, having lobes with incisions that extend less than half-way toward the petiole. palmatipartite palma + partiri entire leaf Having lobes with incisions that extend over half-way toward the petiole. palmatisect palma + secare entire leaf Having lobes with incisions that extend almost up, but not quite to the petiole. pandurate panduratus entire leaf Fiddle-shaped; obovate with a constriction near the middle. pedate pedatus entire leaf Palmate, with cleft lobes. peltate peltatus stem attachment A round leaf where the petiole attaches near the center. An example would be a lotus leaf. perfoliate perfoliatus stem attachment With the leaf blade surrounding the stem such that the stem appears to pass through the leaf. perforate perforatus leaf surface features Many holes, or perforations on leaf surface. Compare with fenestrate. pinnately lobed pinna + lobus entire leaf Having lobes pinnately arranged on the central axis. pinnatifid pinna + findere entire leaf Having lobes with incisions that extend less than half-way toward the midrib. pinnatipartite pinnatus + partiri entire leaf Having lobes with incisions that extend more than half-way toward the midrib. pinnatisect pinnatus + sectus entire leaf Having lobes with incisions that extend almost, or up to midrib. plicate plicatus 3-d shape Folded into pleats, usually lengthwise, serving the function of stiffening a large leaf. reniform reniformis entire leaf Shaped like a kidney: an oval with an inward curve on one side. retuse leaf tip With a shallow notch in a round apex. rhomboid or rhombic rhomboidalis entire leaf Diamond-shaped. rounded rotundifolius leaf tip or base Circular, no distinct point. semiterete 3-d shape Rounded on one side, but flat on the other. spear-shaped hastatus entire leaf see hastate. terete 3-d shape Circular in cross-section; more or less cylindrical without grooves or ridges. Leaf margins (edges) are frequently used in visual plant identification because they are usually consistent within a species or group of species, and are an easy characteristic to observe. Edge and margin are interchangeable in the sense that they both refer to the outside perimeter of a leaf. Leaves may also be folded or rolled in various ways. If the leaves are initially folded in the bud, but later unrolls is its called vernation, ptyxis is the folding of an individual leaf in a bud. The Latin word for 'leaf', folium, is neuter. In descriptions of a single leaf, the neuter singular ending of the adjective is used, e.g. folium lanceolatum 'lanceolate leaf', folium lineare 'linear leaf'. In descriptions of multiple leaves, the neuter plural is used, e.g. folia linearia 'linear leaves'. Descriptions commonly refer to the plant using the ablative singular or plural, e.g. foliis ovatis 'with ovate leaves'. 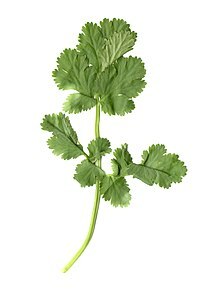 ^ Also used to describe compound leaves with finger-like leaflets. ^ Mucronate, Answers.com, from Roget's Thesaurus. ^ "palmate (adj. palmately)". GardenWeb Glossary of Botanical Terms. ^ "Leaf description glossary". www.cs.rochester.edu. Retrieved 2017-11-02. ^ "Pedate leaf". Retrieved February 24, 2014. ^ Stearn (2004), pp. 439–440. Stearn, W.T. (2004). Botanical Latin (4th (p/b) ed.). Portland, Oregon: Timber Press. ISBN 978-0-7153-1643-6. Wikimedia Commons has media related to Category:Leaf margins. Wikimedia Commons has media related to Category:Leaf diagrams. This page was last edited on 21 March 2019, at 02:07 (UTC).